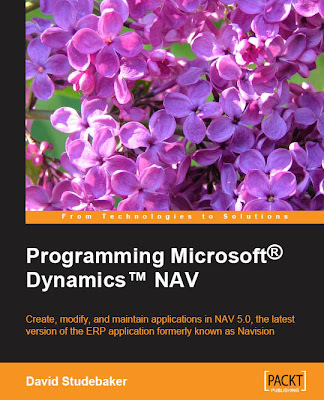 This is the only Nav programming book available in the market. If this book was released a few years earlier, I think my experience in learning Navision will be much easier. I am the type who can learn best from book compared to other learning material. When I first started to learn Navision in Year 2005, I tried to get myself a book on Navision programming, but unfortunately, I was not able to find any book regarding Navision programming. Lacking of book in the market makes my Navision learning horrible compared to other programming tool that I have learned. Programming Microsoft Dynamics Nav covers all the bolts and nuts that you need to get started on Navision programming. You don't need any prior Navision knowledge to read this book. This book is more suitable for beginners compared to experienced developers. Experienced developers should already know most of the stuffs in the book, but still can get some tips and trick from the book. This book was written based on Dynamics Nav 5.0 but you won't have much problem following the example in the book with Navision 4.0. The interface will be different and some of the advanced features such as XML Port may not be available if you are using versions older than Navision 4.0. If you are not willing to invest on the book, the Application Designer Guide that comes together with Navision CD can be a good start. I learned Navision from the Application Designer Guide as well because I have no choice at that time. If David Studebaker has released the book earlier, I definitely won't mind to invest $59.99 for the book. What is $59.99 if it can help me learn Nav faster and easier.